How much battery capacity do I need with an inverter? As a rule of thumb, the minimum required battery capacity for a 12-volt system is around 20 % of the inverter capacity. 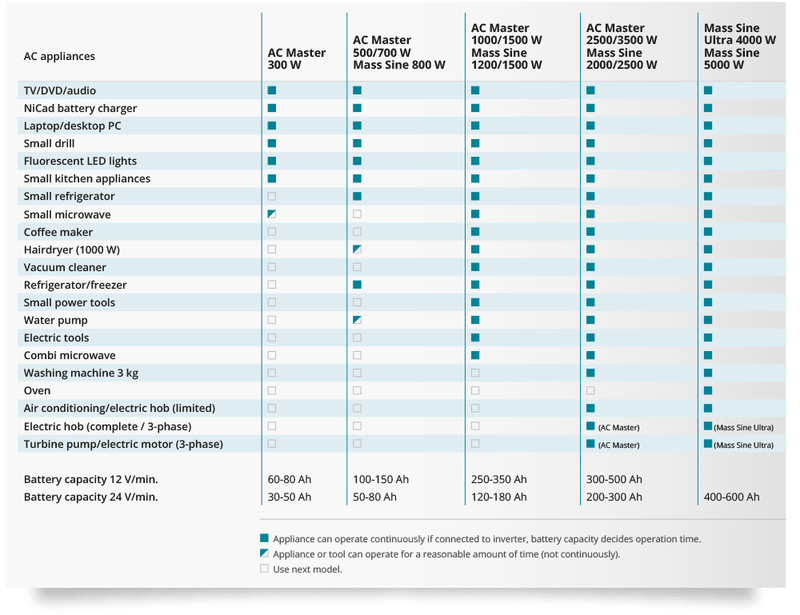 For 24-volt inverters, it is 10 %. The battery capacity for a 12-volt Mass Sine 12/1200, for instance, is 240 Ah, while a 24-volt Mass Sine 24/1500 inverter would require at least 150 Ah. The indicated battery capacity is only for the inverter. The capacity required for other loads should be added to it. How much power does an inverter consume? Mastervolt sine wave inverters have an output efficiency of more than 92 %, which is the maximum that can be achieved with modern technology. If you connect an 850 W coffee maker to a Mass sine wave inverter, consumption will be 850 W divided by the onboard voltage of 12 volt, approx. 70 A. Of course, a coffee maker will only be in use for a short period of time, so the consumption measured in Ah will be relatively modest (76 x 5 min. = 6.5 Ah). As a rule of thumb you should divide the connected capacity by 10 for 12 volt and by 20 for 24 volt. This also includes all the power losses in the cables, fuses and the inverter. Is there a stand-by switch on the inverter? Definitely! 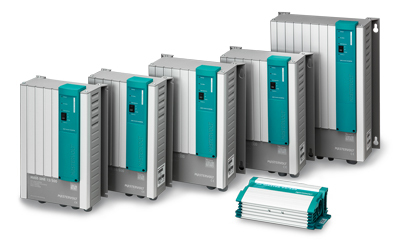 Although the no-load consumption is extremely low, most Mastervolt inverters and Combis are even equipped with two energy saving solutions. Activating the Economy mode reduces battery consumption by an extra 10 %. This function requires an adjustment to the dipswitch/jumper settings, which can possibly be realised via the free downloadable software. The economy mode ensures that the output voltage drops slightly to 208 V, which also reduces the power consumption from the battery. Low-load devices like microwaves and DVD clocks function as normal at this lower voltage.With some inverter models it is even possible to activate a stand-by mode. In this mode the inverter sets a tiny pulse on the 230-volt installation, checking for any connected appliances. As soon as the pulse detects consumption, voltage returns to normal strength to power the connected equipment. The economy mode ensures that the power consumption of the inverter stays at virtually zero. Can I power a computer with an inverter? Yes, you can. All Mastervolt sine wave inverters can easily and safely supply a computer without the slightest problem or risk. In fact, the output voltage from an inverter is often better than that from the electricity grid or shore power. This is why Mastervolt inverters, combined with a battery charger and a battery set, are often used as a back-up system in places where the grid connection is unreliable. Laptops can also be powered by a Mastervolt inverter. Can a microwave be powered with an inverter? Any microwave model can be connected to a Mastervolt inverter. Bear in mind that an 800-watt microwave consumes about 1200 to 1300 watt from the 230-volt system, and that the capacity of the inverter and battery must be able to handle this. Apart from that, the total consumption of the microwave-inverter combination is moderate: Using the microwave for five minutes will use around 12 Ah on a 12-volt system and 6 Ah on a 24-volt system. Are there any appliances that cannot be powered by an inverter? You can connect almost any appliance to an inverter, with a few practical exceptions. In practice you must be careful with equipment that consumes a lot of power, such as electrical heaters or air conditioning. While the inverter itself has no problems with these loads, the battery capacity is often too limited for long-term usage of these loads.Appliances that are only used for a limited time period, such as washing machines, driers or a small hotplate, should be fine as long as the battery has sufficient capacity. In these cases it is advisable to use a power source such as an alternator, which also powers the battery. Keep in mind that heavy users such as engines, pumps, air conditioning and fridges have a starting current that is between 5 to 12 times higher than the nominal absorbed capacity. The inverter has to be able to supply accordingly. Mastervolt inverters are developed to provide high peak currents. How much current will an inverter draw from my batteries? This depends on the equipment connected to the inverter. There is a simple method to calculate how much power your inverter is using: For 12-volt inverters, divide the connected load by 10; for 24-volt inverters, divide by 20. Example: How much does an inverter consume with a 400 W load connected? For a 12 V inverter such as a Mass Sine 12/1200, consumption will be 400/10 = approx. 40 amps. For a 24 V inverter, say a Mass 24/1500, the corresponding figure is 400/20 = approx. 20 amps. It is important to remember that this is only an approximation: The actual consumption will tend to be some 5 to 15 % less, depending on the load type. How thick should my battery cables be? Using the method described above, calculate how much power your inverter will be drawing at maximum capacity (120 amps in the case of a Mass Sine 12/1200, for example). Then count 3 amps per mm². In the above example this is 120 divided by 3 = 40 mm². The standard cable thickness closest to that is 35 mm². This rule applies to cables up to three metres in length. If the inverter is further away from the battery, choose the next size up (50 mm² for instance). Does an inverter need a lot of ventilation? An inverter needs very little ventilation - two approx. 60 cm² ventilation openings are usually enough. Larger inverters, from 1500 W upwards, need twice that size. Inverters used in high ambient temperatures, and those expected to be operating at full capacity for a long period, require openings that are four times as large. Can an inverter be used in parallel with the generator or the grid? No, stand-alone inverters cannot function in parallel with a generator or grid connection. A Mastervolt Mass Combi is the solution if you need more power than is available from the grid connection or the generator. These models can compensate for the lack of grid or generator power using the batteries. A Masterswitch or Systemswitch needs to be installed when grid or generator power is connected to the onboard grid simultaneously with an inverter. The main function of the Masterswitch is the automatic and safe switching between grid, generator and inverter power. No-load is the amount of current used by the inverter when no loads are switched on, while the inverter is switched on. An inverter uses a small amount of energy during the conversion process. 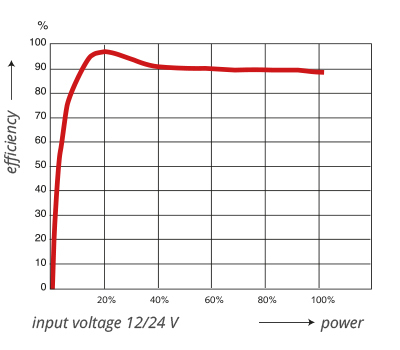 The difference between the input power and the output power is expressed in percentages. The efficiency of modern inverters is more than 92 %. This means that a maximum of 8 % of the power consumption is used to convert battery voltage to 230V/50Hz. A connected load of 250 watt, for instance, requires less than 270 watt to be supplied by the batteries. What are trapezoidal or square wave inverters? Square wave and trapezium inverters are often available in DIY shops and supermarkets at low prices. These cheap inverters are not suitable for all loads, however, and therefore not safe to use. Modern inverters generate a sine wave-shaped output current similar to or even better than that of the public grid and perfectly suited to powering sensitive equipment. Trapezoidal inverters, also called modified sine wave, are the ancestors of the modern sine wave inverters. As the name suggests, they generate an output voltage in the shape of a trapezium. This type of voltage is inappropriate for sensitive equipment. The square wave inverter is the predecessor of the trapezoidal inverter and represents the first generation of inverters. It is also very unsuitable for delicate equipment. Can I power an air conditioning system via the inverter? It is perfectly possible to power a small air conditioning installation of, for instance, 4500-6000 BTU via an inverter. While it is important to remember not to leave the air conditioning running for too long, cooling down a cabin before going to sleep is fine as long as the battery bank and inverter are correctly sized. Also remember to pay attention to the start-up current, which can be up to eight or twelve times higher than nominal capacity. A 6000 BTU air conditioning uses approximately 700 watts. For a 230 V system this means a current consumption of approximately 35 amperes. Cooling down a cabin within two hours requires 70 Ah for a 24 V system and 140 Ah for a 12 V system. It is important to make sure that the inverter is large enough to provide the starting current for the air conditioning, and the battery also needs to be able to supply the required capacity within two hours as well. Can I cook with electric appliances using an inverter? Cooking is definitely possible with an inverter as long as the battery set is reasonably large and the inverter has a capacity of at least 2 kW. The preparation of a complete meal will, in general, require the generator to be activated or power to be plugged in. Switching on the generator to heat up a cup of soup or cook a steak or an egg is rather wasteful, since the generator will not even warm up properly before it is turned off again. This is bad for the generator and the environment. Instead, we recommend that you power only one or two of the hotplates via the inverter – a snack can then still be prepared or heated without needing to start the generator. After using the cooker, recharge the battery fully via the battery charger or alternator.